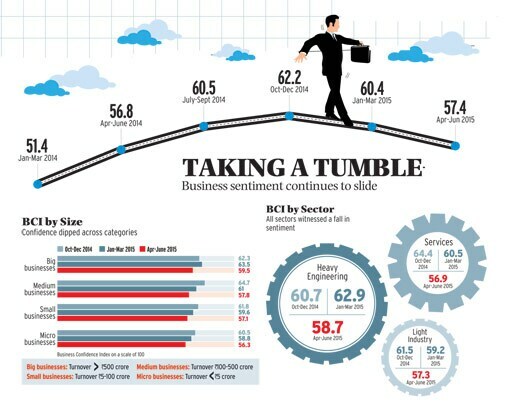 Business confidence dips for the second straight quarter despite the Modi government's efforts to give a fresh impetus to the economy, finds the latest Business Today-C fore Business Confidence Survey. It has been a rollercoaster ride for the Narendra Modi-led NDA government over the past few months. It has surpassed expectations of corporate India on some fronts - controlling inflation and reining in fiscal deficit - but has also fallen short in many areas. The ultimate test for any government's economic prowess lies in its ability to boost the performance of the private sector. Despite some concerted efforts by the government to revive growth, the last quarter of 2014/15 saw a near-flat (two per cent) growth in corporate earnings, and a sharp dip (18 per cent) in aggregate net profits. All this seems to be reflecting in the latest Business Today-C fore Business Confidence Survey. Indeed, confidence levels, on a scale of 100, have slipped to 57.4 in the April to June quarter, down from 60.4 in the previous January to March period. It's the second consecutive quarterly decline in business confidence. Business confidence index has seen a sharp upswing followed by a slump in the past 18 months. It had started improving in the January to March quarter of 2014, just before the general election, and reached its third-highest value (62.2) since the launch of the survey in the January to March quarter of 2011. Market research agency C fore quizzed 500 CEOs and chief financial officers across 12 cities for the survey. 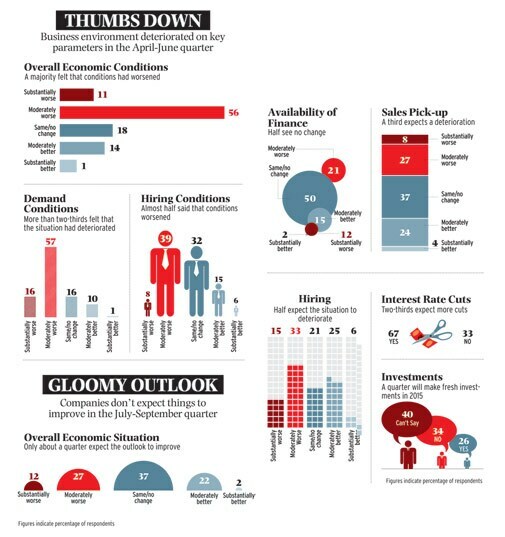 Respondents in the survey expect status quo or worsening of the situation on several indicators. Take financial situation, for instance. Some 36 per cent expect the situation to worsen in the July to September quarter. The corresponding figure in the last survey was 33 per cent. Similarly, more respondents (33 per cent) are concerned about the availability of finance in the current quarter as compared with the last survey (22 per cent). Ajay Seth, Chief Financial Officer of automaker Maruti Suzuki, says that NPAs (bad loans) in the banking system have gone up so sharply that lenders have become cautious. "Banks are likely to lend to companies with good credit ratings." According to the survey, exports growth is another area where most respondents are pessimistic. Some 51 per cent are expecting a drop in exports in the July to September quarter compared with 46 per cent in the previous survey. In April, exports contracted by 14 per cent over the previous year. It was the fifth consecutive monthly drop in exports. "It is a reflection of weak international and domestic demand conditions," says D.K. 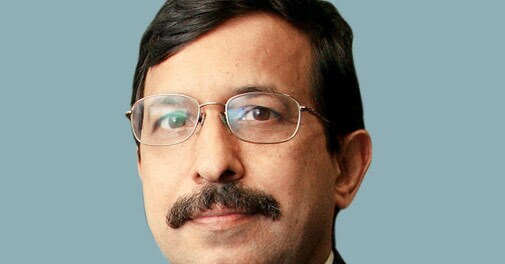 Joshi, Chief Economist at ratings agency CRISIL. A May 2015 report by CRISIL had pointed out that low demand, not policy, is the biggest problem for corporate India at the moment. "The investment cycle [is] unlikely to restart soon and growth recovery will be a slow process," the report said. Joshi says that since private sector investment is not picking up, the government is trying to "frontload" its expenditure budget and that could help boost demand. Some 9.1 per cent of the total annual expenditure was done in April alone. "There's a realisation that there's no magic bullet with the government. 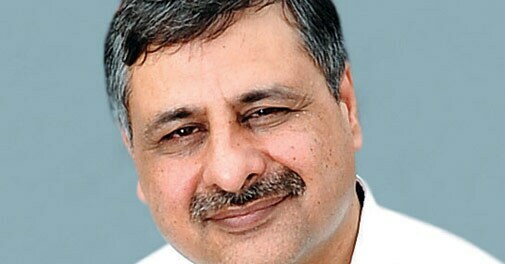 The recovery cannot happen with fiscal policy or interest rate cuts," says Joshi. More respondents (30 per cent) expect selling prices to get affected in the current quarter as compared with the previous survey. Also, a higher number of respondents (32 per cent) expect their profits to shrink in the same period. In the current survey, only 26 per cent respondents have shown their willingness to make fresh investments in 2015. More than one-third respondents (35 per cent) had expressed their interest in making investments in 2015/16 in the previous quarter. Experts point out that this is possibly linked to under utilisation of installed capacity and lower consumption. "Corporates are still in a wait-and-watch mode. The overall demand is better than last year but the cycle has to turn," says Seth. Corporate leaders are hopeful that the situation will improve in some areas. For example, 93 per cent of the respondents feel that the cost of external finance will improve or remain same in the July to September quarter. In the April to June period, the figure was 88 per cent. Also, they expect more interest rate cuts going forward. In June, a report by Citigroup said that key interest rate is likely to be reduced by another 25 basis points this fiscal with retail inflation under control. However, the last three repo rate cuts by the Reserve Bank of India (RBI) have not translated into lower lending rates for end users, both retail and corporate. Banks have resisted paring rates significantly. The successive fall in confidence levels is a cause for concern. 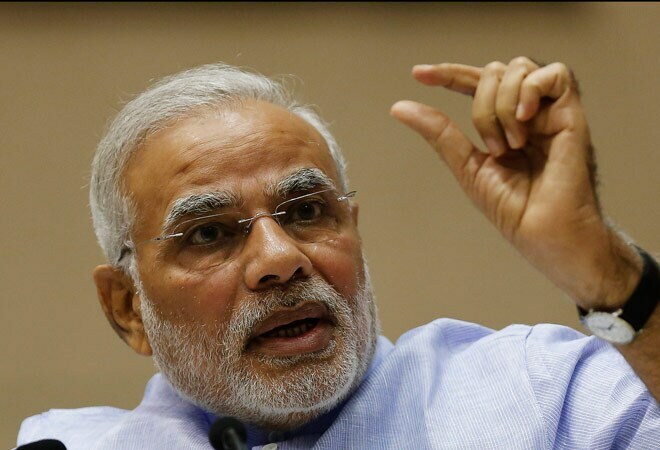 It should prompt the government to move faster on various fronts and make up for lost time.